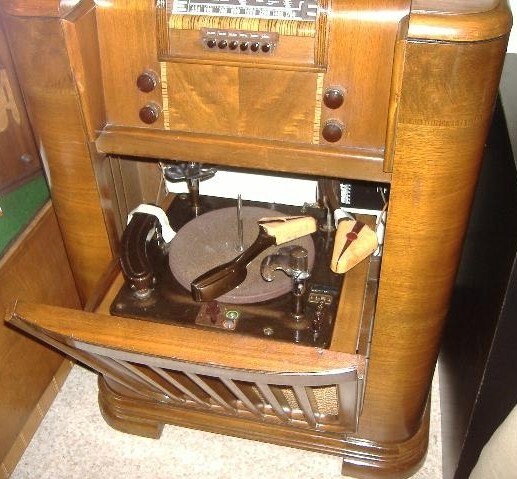 Wax on: This radio has a turntable for recording broadcasts. Once upon a time, the FM band was not where we now find it, but between 42 and 50 MHz. That was before the end of World War II. In 1945, the Federal Communications Commission moved the band to 88-108 MHz to accommodate the television spectrum. I learned these facts during a family visit to the Radio and Television Museum, a little gem in a reconstructed farmhouse in Bowie, Maryland, about an hour from where we live. Instead of wandering the two floors, we took the guided tour and were amazed at how much history the little house contains – from the earliest wireless sets that played only Morse code, to cabinet-sized black-and-white TVs like the kind we had when I was a kid. But something struck me about that switch in the FM dial. Something that happens with such regularity now, but must have come out of the blue for radio owners. Obsolescence. FM was not the powerful medium it became in the 1970s. Still, there were 15,000 FM receivers in use in 1941, Brian Belanger, the museum’s executive director, writes in “The Rise of FM Broadcasting.” And those owners had paid for an expensive product – the equivalent of thousands of today’s dollars. As America entered the war FM was on the rise — 50,000 FM sets were sold in January 1942, according to Belanger. Then production was halted. By the time FM radios were being built again, the FM band was not where it once was, and those radio owners, those early adopters – unlike today’s TV owners who have a box to unscramble the new digital broadcasts – were out of luck. What change in technology was the biggest adjustment for you? What has gotten lost in the rapid technological shifts?